This board has its origins form an article I wrote back in 1985 for Micro/Systems Journal in which I described a S-100 board that allowed one to insert an IBM-PC 8 bit board into the S-100 bus (see here). 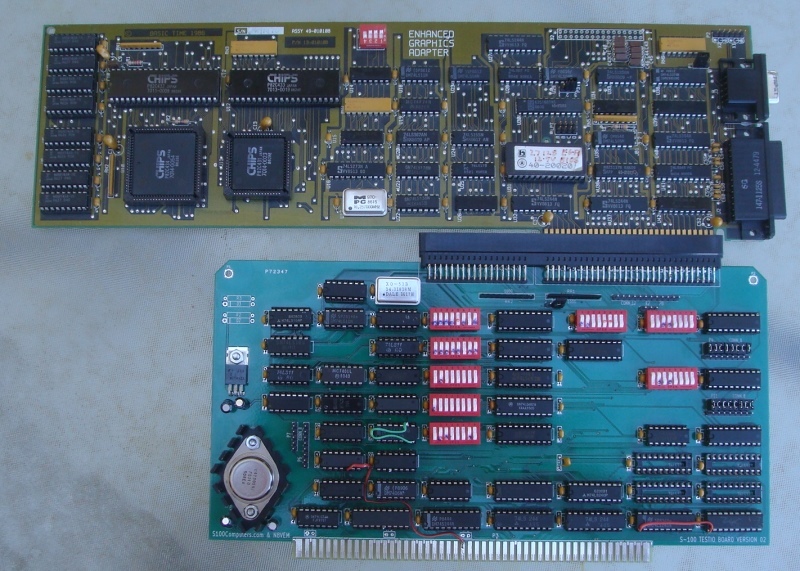 In particular it allowed one to utilize an S-100 8088 or 8086 CPU board with an IBM CGA and monochrome video board (which were not available for the S-100 bus at the time). Below is a picture of that 1985 board. 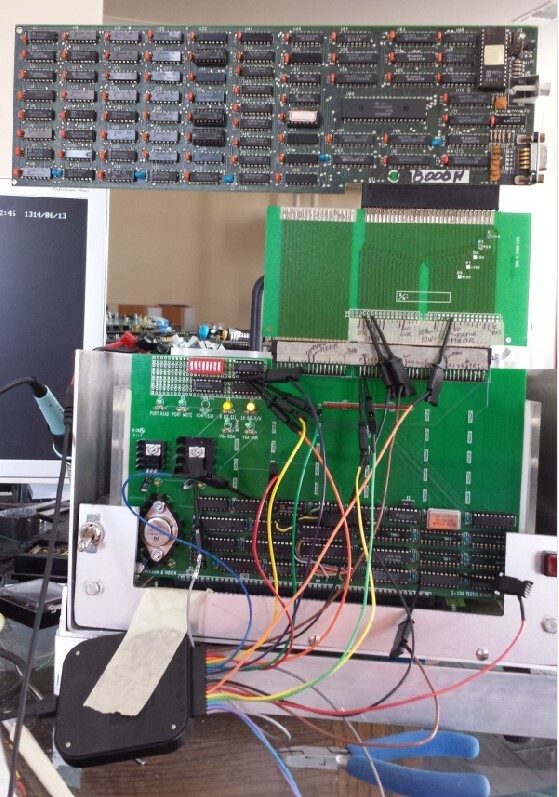 The board was connected via a top ribbon cable to an IBM-PC bus board (made by I-Bus Systems). While the board illustrated above worked reliably for IBM-PC type speeds, it was unsuitable for the higher S-100 bus speeds (~10 MHz) we have today with some of our boards. 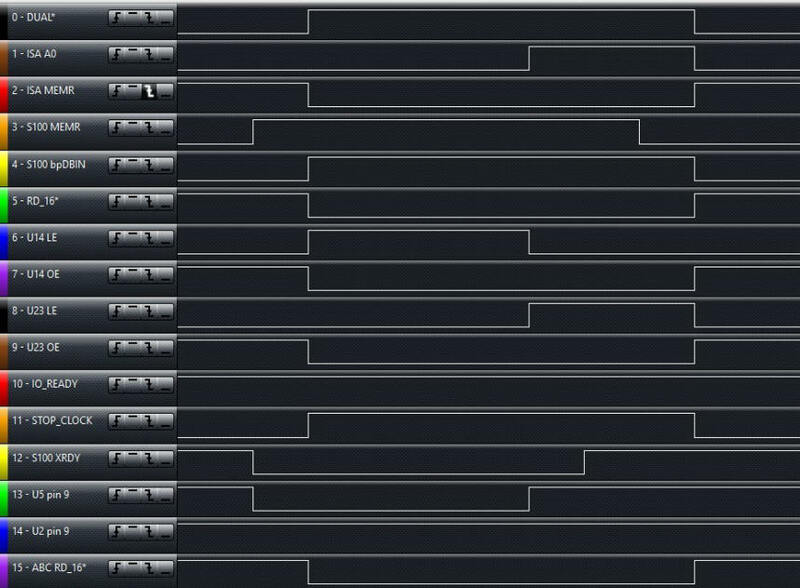 This is because the board utilized 74LS121 single shots to "synthesize" some of the critical ISA signals. This is fine for a fixed low frequency system like the original PC. 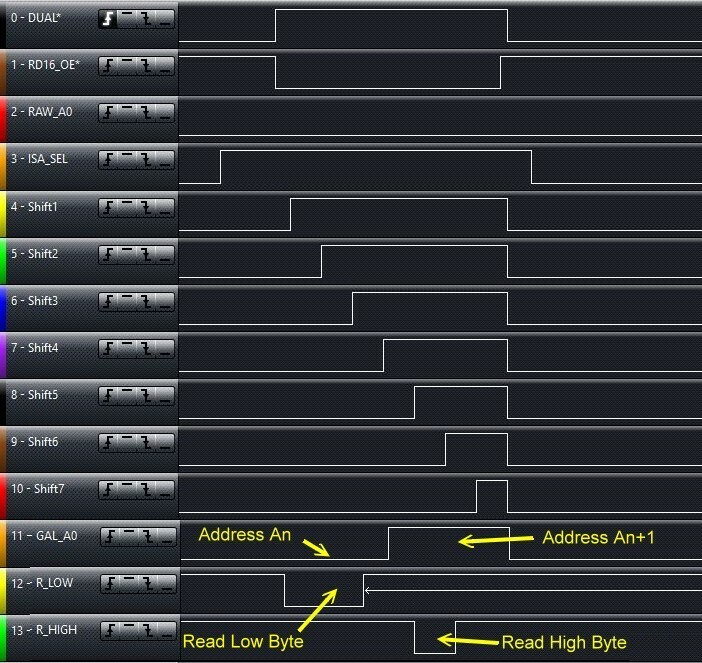 For clock frequency independence one should use shift registers to synthesize signals (see below). Also it would be much more useful to utilize a PC-AT style 16 bit ISA bus so that more modern VGA type cards could be used. However going from 8 to 16 bits has a serious complication. In an PC-AT style system if a ISA card cannot accommodate a 16 bit data word it forces the CPU on the motherboard to sequentially send first the lower then upper 8 bit bytes, each with its own memory/IO read or write signals. The motherboard CPU only assumes a 16 bit data word will be accepted if it detects the ISA signals MEMCS16* or IOCS16* are low. If either are low the CPU immediately sends/receives the 16 bit data. This is a bit of a complication for us, because most S-100 CPU boards (including our own S100Computers boards) do not have this capability. The S-100 IEEE-696 specifications does in fact describe it and an option but it was little used in the past because IEEE-696 S-100 bus RAM boards and the likes at the time could easily deal with 16 bit data. The lowered S-100 sXTRQ* line (Pin 58) was always acknowledged with a returned lower SIXTN* (pin 60). Older 8 bit only RAM boards simply had too small a capacity or speed to be useful. That said, there were a few 8086 boards that did work with the older 8 bit RAM boards. 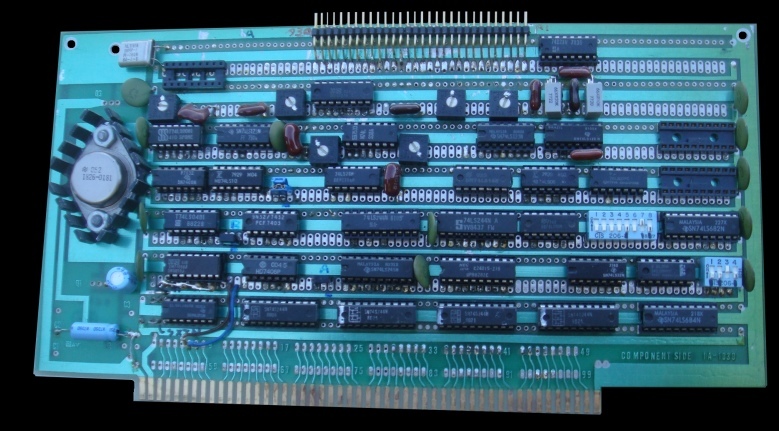 The TecMar 8086 board is a good example. The manual clearly describes the sequential 16 bit to back to back 2X 8 bit transfer process. It was the starting point for the circuit below. However it does not provide two discrete read write signals -- something some of the ISA video chips seem to require (see below). Fortunately because both buses have as their basis Intel style origins, a number of the signals are very similar. For a thorough description of the bus signals I recommend the Sol Libes & Mark Garetz "Interfacing to S-100/IEEE696 Computers" and the Edward Solari "AT Bus Design" books. The address lines are essentially similar for both buses. The upper ISA lines (A17-A23) are not latched (and in fact float during RAM refresh cycles), it is up to ISA boards to latch them. We will latch all address lines using the S-100 pSTVAL signal. This signal will also emulate the ISA BALE signal. 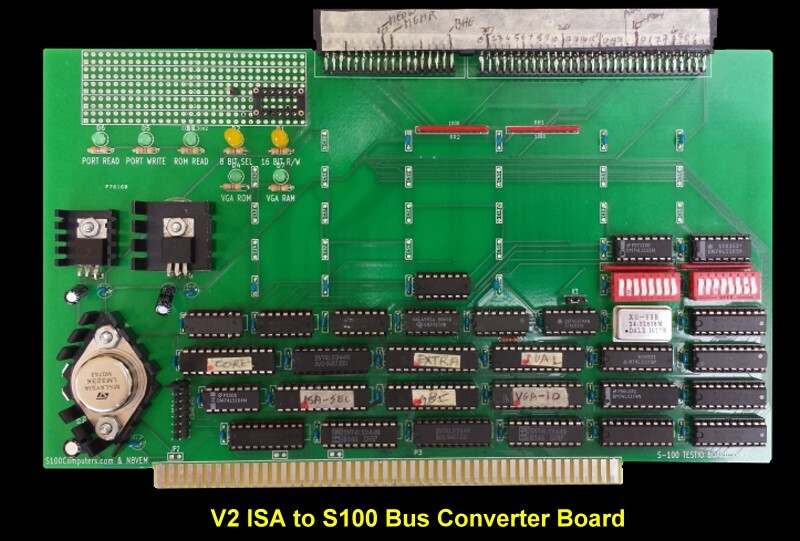 For mainly historic reasons the ISA bus has two Memory Read/Write signals depending on whether the CPU is talking to RAM on the motherboard or a card in the ISA bus. We will treat both as identical. The ISA bus IOCHRDY has the same function as the S-100 bus XRDY & RDY signals, i.e. delay a CPU cycle for a slow memory or I/O access. There are two clock signals on the ISA bus. The BCLK signal is essentially the CPU clock and will be provided by the S-100 bus Phi signal (pin 24). The second clock is mainly used by early PC video boards. It provides a 14.31818 MHz TV Color burst frequency. The ISA bus has more interrupt pins than the 9 on the S-100 bus so we will use jumpers to select those needed. The ISA interrupts are normally edged triggered and any S-100 hardware (e.g. 8259A) would have to be programmed accordingly. 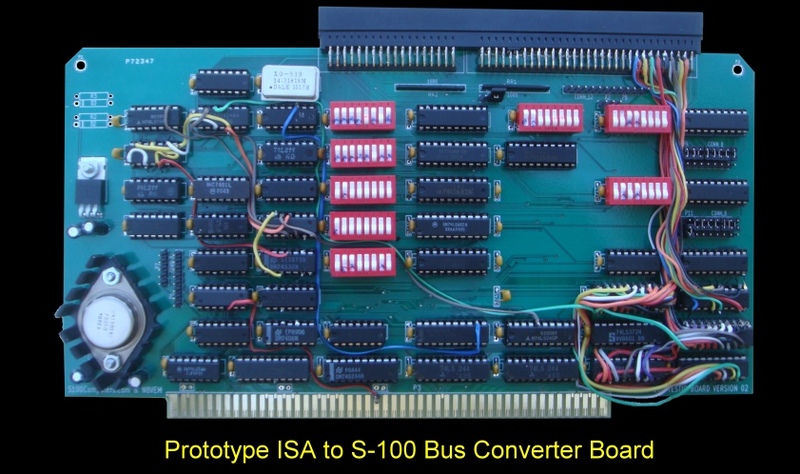 The ISA bus has 6 DMA request and acknowledge lines in contrast to the S-100 buss's 4. On the ISA bus all share a TC (terminal count) line use to indicate when a DMA transfer is complete. In it's current form, we will not implement ISA bus DMA control in the S-100 bus. It could be done, but if required it easier to do DMA on the S-100 side. The remaining ISA signals are either straightforward or are unutilized (pulled as required high or low). Clearly we are going to have to tread very carefully as we implement data transfers between the two bus's. In order to have a converter board that is S-100 bus clock frequency independent we will use the S-100 Phi clock signal (Pin 24) to drive a shift register (a 74LS164) from which will be tapped sequentially various control signals. The problem case is when we wish to send a 16 bit word to an ISA board that can only accept byte data (RAM or I/O). 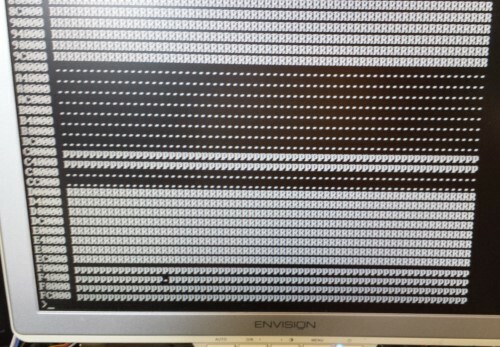 This unfortunately is a common situation with VGA video controller chips. We need to hold the S-100 16 bit word (put the CPU in a wait state), send the low byte + write signal to the ISA board, wait, then send the high byte + write signal, then release the S-100 CPU from it's wait state and continue to the next bus cycle. Fortunately to debug this complicated situation we have one S-100 board that comes to the rescue. Our S-100 8088 CPU board does within the CPU exactly what I described above. Internally its a 16 bit CPU but externally it's 8 bit. It will always interact with an ISA board exactly as the IBM-PC does. I used this board to first get our converter board working. Even with this we will step things along slowly. First we will work with an old IBM-PC CGA video board not only because it is strictly 8 bit, but it does not require an onboard ROM to initialize the board. We will then step up to an EGA video board. This board does have an onboard ROM but the interface is well described as is the software. It too is an 8 bit only ISA board. Next we will utilize an 8 bit VGA video board, Then a true 16 bit ISA VGA board. All these boards must work seamlessly with MSDOS V4.01 using the video board as a standard IBM-PC console output. You can see the ISA connector at the top of the board. There are no right angled ISA connectors, so in order to get this arrangement I soldered the ISA socket pins directly to a dual row set of right angled jumpers. (Jameco #139564) cut to size. First I tried the board with an old IBM-PC CGA video board. Frustratingly that board (8 bit only data) does not fit into the ISA socket because the upper 32 pin section of the socket blocks the board seating properly. I had to place a bus extender card in the lower 62 pin section of the ISA socket and then place the CGA card in the extender board. Looked like a real kludge sticking way up over the S-100 bus. But fortunately it worked. 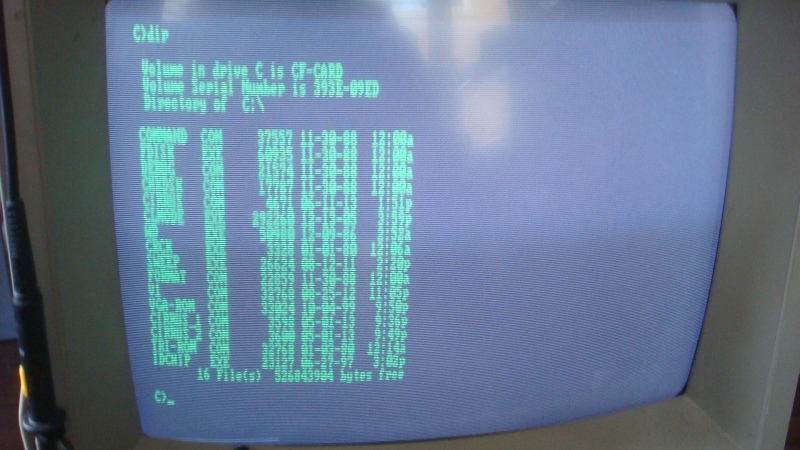 Here is a picture of MSDOS V4.01 signing on using the above arrangement the output going to an old PC video monitor. To recap, what we have here is our S-100 8088 board directly driving a standard IBM-PC video board utilizing our bus converter card. Next I moved the ISA converter board up to working with an EGA board. I used a "Basic Time" 1986 EGA clone board. It is driven by four C&T chips. This is still an 8 bit bus board but unlike the above CGA board has its own onboard EPROM (at C000:0H to C000:7FFFH). As I worked with this board I had to make numerous circuit changes and alterations. It became clear that I would have to fabricate a second prototype. I actually did another prototype board with numerous jumpers but again found the circuits did not work correctly with 16 bit data transfers at S100 bus speeds in the 8-10MHz range. In particular there was a problem with ISA VGA boards during screen scrolls. When the ISA IO_READY signal was being asserted. Long story short, if IO_READY went high while XRDY was asserted by the shift register (U20) the sequential back to back 8 bit R/W's got screwed up. The "stretching" of the critical signals got out of sync with the video board. Frustratingly I dropped this project for a number of months to rethink the whole approach. 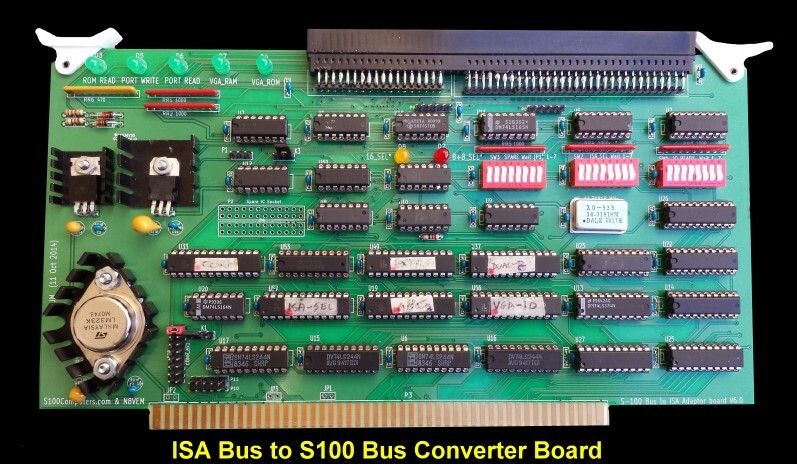 It became clear that to move forward with this ISA to S100 bus converter board I was either going to have to design a very detailed signal software emulation program or design a prototype board with numerous jumpers with spare gates etc. to find a solution by trial and error. The good news on the latter was I could easily run tight CPU loops reading/writing words or bytes to a designated RAM or I/O port and analyze the signals with an 8 input logic analyzed. At about that time I discovered GAL's. These are chips that can be programmed to emulate multiple AND, NAND, Inverter and FF gates -- all residing in a single chip. I realize these chips may not be familiar to some users so I have written up an introduction to them here (Introduction to GAL's). Please study that page before going further if you are unfamiliar with GALs. 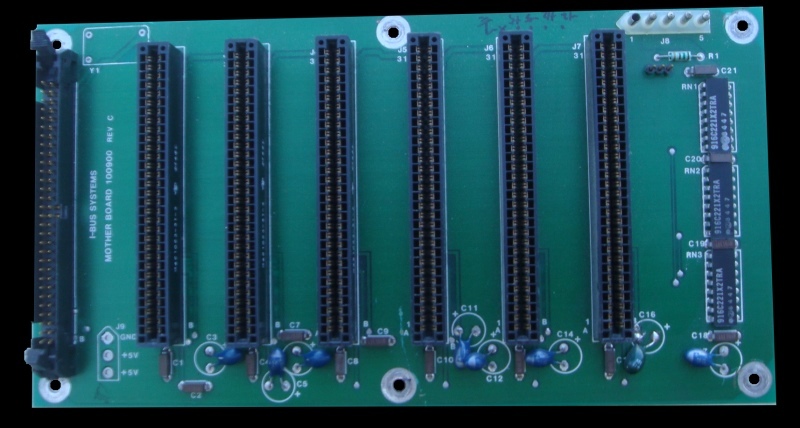 Another version of this ISA to S100 Bus Converter board was fabricated utilizing GALs. A GAL based ISA to S100 Bus Converter Board. 1 8 bits to/from the S100 CPU to the ISA bus. 2 16 bits to/from the S100 CPU to the ISA bus. The 74LS164 (U20) provides shift delays relative to the start of an S100 bus, bus cycle. Two things to note, via U4C, these shifts are only generated when ISA_SEL and DUAL_REQUEST are both high. 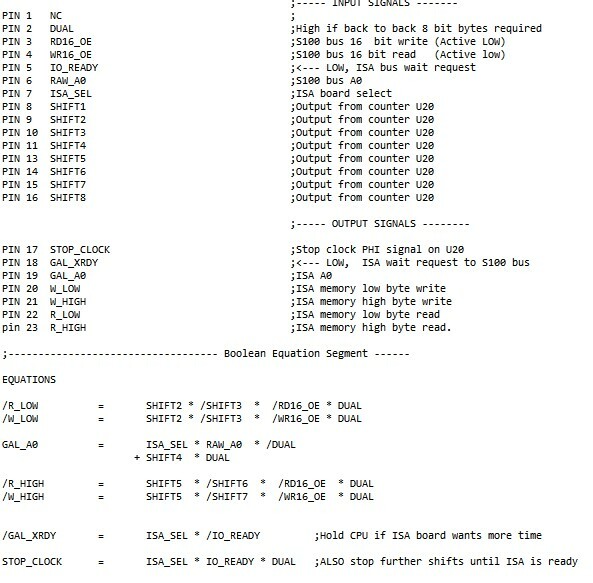 As we shall see ISA_SEL is only high if an ISA board port or RAM area is selected. DUAL_REQUEST is only selected if an S100 bus 16 bit data transfer is taking place and the ISA board requires it to be transferred as two 8 bit back to back transfers. 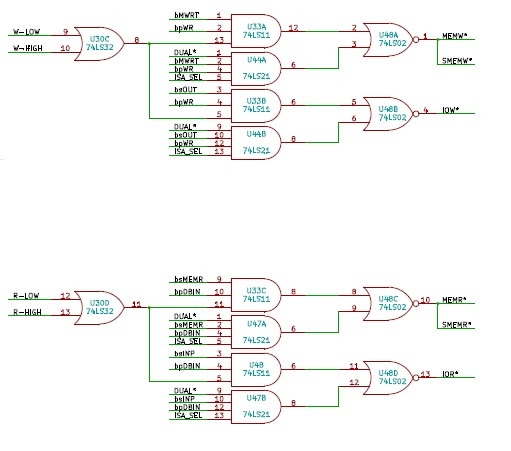 Here is a picture of the logic levels coming out of U20 and used to pulse the ISA bus MEMR signal. The R_LOW and R_HIGH signals are then fed to another GAL to pulse the ISA to S100 bus buffers. Note that U13 is a 74LS374. 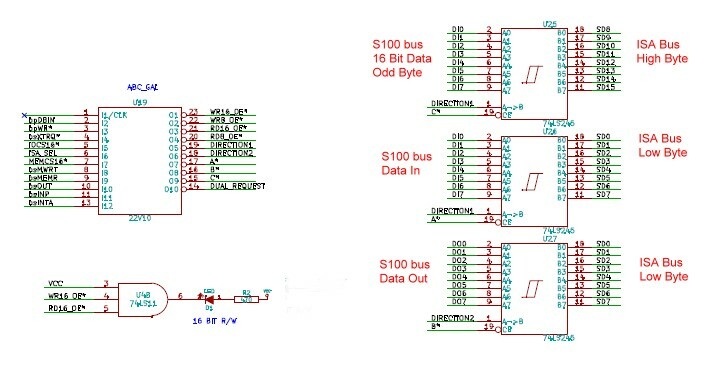 This chip allows the data from the S100 bus to be latched into U13 on the rising edge of the W_LOW signal and held there after the address line is incremented to the odd/high byte. Here is the GAL code to signal the timing inputs for the above 4 buffers. There are a total of six 22V10 GAL's on the board. Three others essentially supply the timed signals to the above two GAL's. 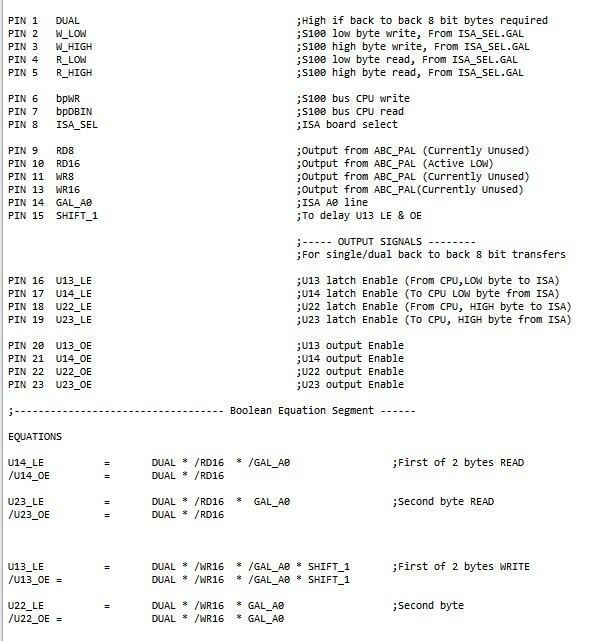 The remaining GAL which I call ABC_GAL is dedicated to driving bidirectional 8 bit (only) data to/from the S100/ISA bus. This GAL also has the capability later to drive bidirectional 16 bit data. This is not currently used (see below). Here is a picture of the relevant circuit. Here is a memory map of what you should see if the VGA board ROM is available to the CPU. It is very important to see the Video BIOS signon bytes 55H,AAH starting at C000:0H in ROM. 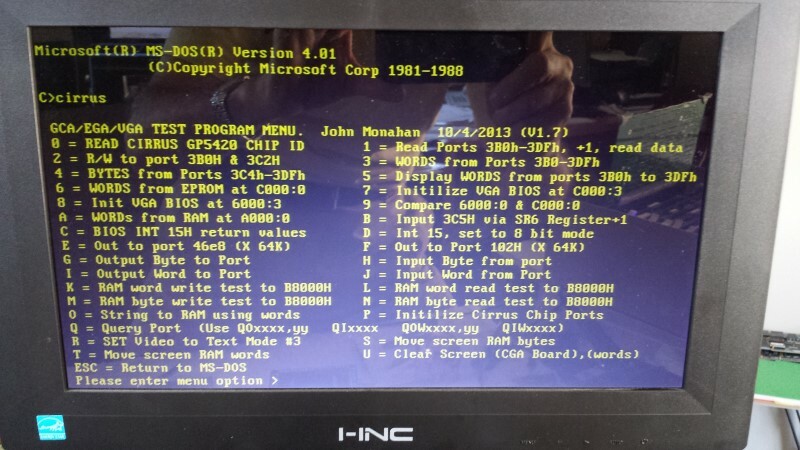 You need to show that they appear as such with the 8086 monitor using the RAM byte display command ("D") and the RAM word display command ("W"). Unless the 8086 monitor sees this 55AA signature it will not call the VGA BIOS initialization routine for a MSDOS boot routine. Instead it will load MSDOS with the default system Console I/O routines. BTW, if bit 2 of the SMB IOBYTE port is set to 0 you can also bypass the VGA BIOS ROM (useful for debugging). I have enlarged my VGA BIOS menu driven MSDOS program for debugging these VGA boards. The menu below is fairly self evident. The source is available at the bottom of this page. The program is called "CIRRUS.COM" simply because it was first written to debug a Cirrus 5420 VGA chip. (Some day I will get back to placing that (more powerful) VGA chip on an S100 board). BTW, the above display is an example of the above Trident ISA board in our S100/ISA bus adaptor board. The next step is to take the core elements of this ISA converter board and the Trident driven VGA board and place them on an S100 board bypassing all the ISA bus connectors etc. One problem I have found with this board is that this GAL conversion circuit will only work with out 8088 and 8086 CPU boards. I have tried to get it to work with the V1 and V2 80286 boards without success. For some reason on those boards the wait states required to generate two 8 bit back to back signals are not stretching out the 82288 Rd/Wr signals. More careful analysis is clearly required. My current thinking for boards past the 8086 board is to wait for the 80486 CPU board I am doing. Because the 80486 can on the fly talk to 8, 16 or 32 bit buses for any bus cycle, a VGA board as described above is actually easy to interface and is next in line for development. 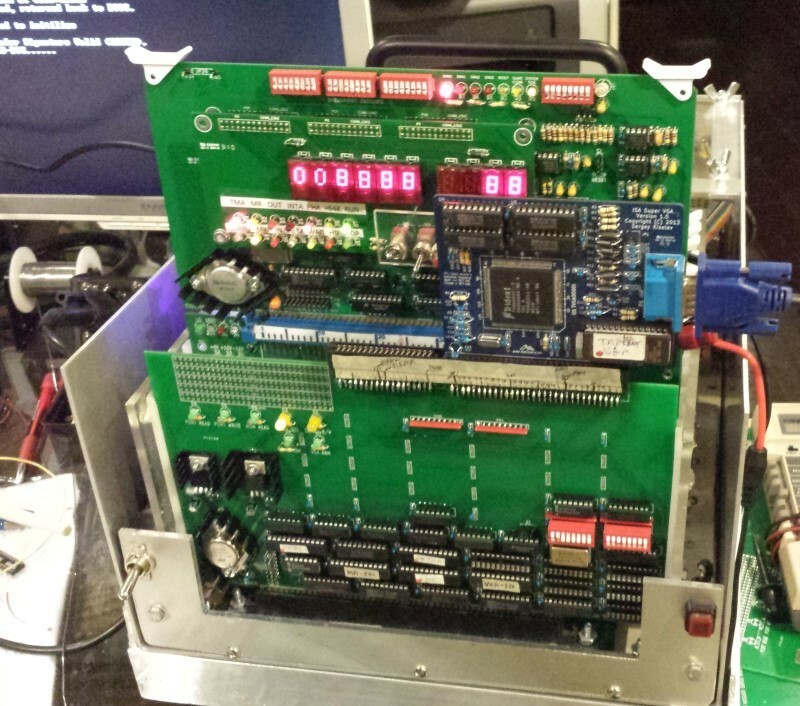 Based on the above prototype board lessons, a "production board" was fabricated. As always examine the bare board carefully for scratches or damaged traces, use a magnifying glass if need be. The quality of the boards we get is excellent, but there is always a first time. A broken trace is almost impossible to detect by eye on a completed board. Next solder in all the required IC sockets, resistors, resistor arrays, capacitors, jumpers, and the voltage regulators. Do not add the LED's or LED bar yet. Be sure you put the resistor arrays in with the correct orientation of pin 1. Check their values before soldering (they are difficult to remove). The TO-3 5V regulator (U54) heat sink must not touch the traces under it. Use either a mica TO-3 insulator or two small nut washers to separate it from the board itself. The reason for this large TO-3 regulator is because some older PC boards use quite a bit of power. The chips on this S100 board get their 5 volts from a 3 Amp TO-220 (U3) regulator (Mouser #511-LM323T). You can probably get away with the 1.5 Amp types (egg Jameco # 924633) but I like to overkill. The Lattice 22V10 GALs can be obtained from Jameco #39159). All the other chips are standard 74LSxx series. Note U13 must be a 74LS374. For prototype boards I generally use "double swipe" IC sockets. For a production board like this I prefer to use "Machine Tooled" IC sockets. However they are more expensive and you have to be particularly careful not to bend the IC pins. The clock oscillator should have its own special socket (e.g. Jameco #133006). The dip switches are best soldered directly into the board. If you have our 8088 CPU board you can test this board with Sergey's ISA Super VGA board in 8 bit only mode. You do not need U13, U14, U22. U23, U25 or the DUAL_GAL (U37). Of course for the 8086 board they must be present. When you have all the chips inserted, check port addressing by inputting & outputting to a VGA port such as 102H, 4CE8H, 3BxH, 3CxH, 0r 3DxH. The appropriate LED's should flash. 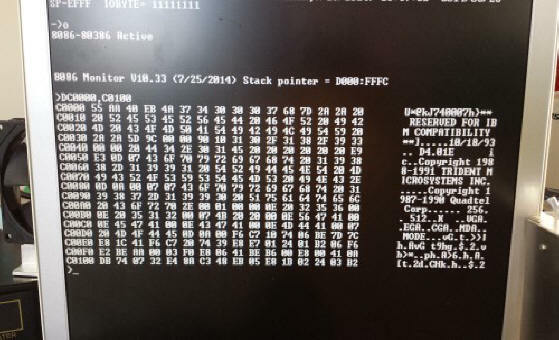 If you have our 8086 ROM monitor running, use the "A" command and do a memory map. The VGA prom should appear at C0000H - C7FFFH. Copy it to RAM and verify the copy went OK. Use the "P" command to boot MS-DOS. The monitor should recognize the VGA ROM and initialize the VGA chips. It will then boot MSDOS with the MSDOS signon appearing on the VGA screen. Realizing that a number of people might want to utilize a board like this together with a group of people on the Google Groups S100Computers Forum, "group purchases" are made from time to time. Contact and join the group if you would like to be involved in this project. Please see here for more information.